Next Generation Embraces Bostock Family Passion for Premium Organic Produce. The next generation of a Hawke’s Bay family which is leading New Zealand in organic produce has another member making her mark on the food and beverage scene. 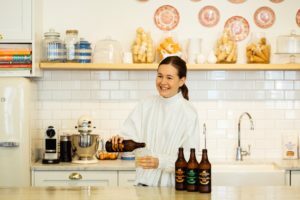 At 23 Liv Glazebrook, who is the neice of Bostock New Zealand’s owner John Bostock, has helped craft a range of premium apple ciders for Lewis Road released last week as “Summer in a Bottle”, infused with delicate blossom flavours. “Every product launch with Lewis Road is an incredibly exciting journey to be part of, but my connection with Hawke’s Bay and family, made this cider launch particularly special. “Using only the finest of ingredients is a focus of my creations both in the Lewis Road kitchen and at home, so Bostock organic apples were naturally the perfect pairing for this cider,” she said. In raising a glass to his niece’s success, John Bostock said it was fantastic to see the next generation of his family embracing the same passion and commitment he has for growing and developing premium quality produce. Already his sons Ben and George Bostocks’ fledging Bostock Organic Chicken business has gone from strength to strength with production doubling this season to meet unprecedented consumer demand. “Liv is doing amazingly well, she’s a rising star and it’s terrific to see her following our family’s passion with her own flare for food. Mr Cullinane said from Liv’s first trials, Lewis Road knew they might be able to do something quite special. “Like with all of our products – we looked to add that Lewis Road twist which would make the cider the very best it can be, and should be. “We’ve still got some of Liv’s trials in the kitchen and there’s always great delight in taking the top off a bottle of her creation,” said Mr Cullinane. At $5.99 for a 518ml bottle the price point has the cider sitting firmly in the middle of the premium cider range. The Lewis Road Orchard Premium Apple Cider range is available now at leading supermarkets and selected liquor stores.